The Fly Orchid can never be described as pretty, but it is one of the most bewitching of the Ophrys species displaying, as it does so perfectly, the highly evolved deception mechanisms that the genus of bee orchids uses to attract pollinating insects.The part of the flower which demonstrates most visibly the results of this evolutionary process is the lip which can be velvety or hairy with a speculum (mirror) in the centre that is hairless and shiny and looks just like the wings of the insects that it hopes to attract. 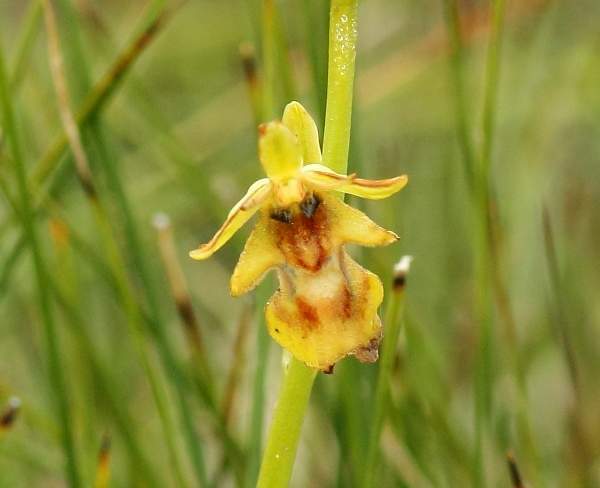 Ophrys insectifera is so distinctive that it is very easy to identify. The flowers closely resemble little flies - the lip forms the body of the insect, the mirror is shiny like the folded wings of a fly and there are even two glossy depressions at the base of the lip which represent the insect's eyes. Fly Orchid plants can grow quite tall - up to 60cm is not uncommon. The plant is spindly and has a lax inforescence which carries up to 15 flowers. Fly Orchids often form colonies of up to 10 plants but despite this they remain difficult to find because the drab colouring blends in so well with the surrounding grass and plants. 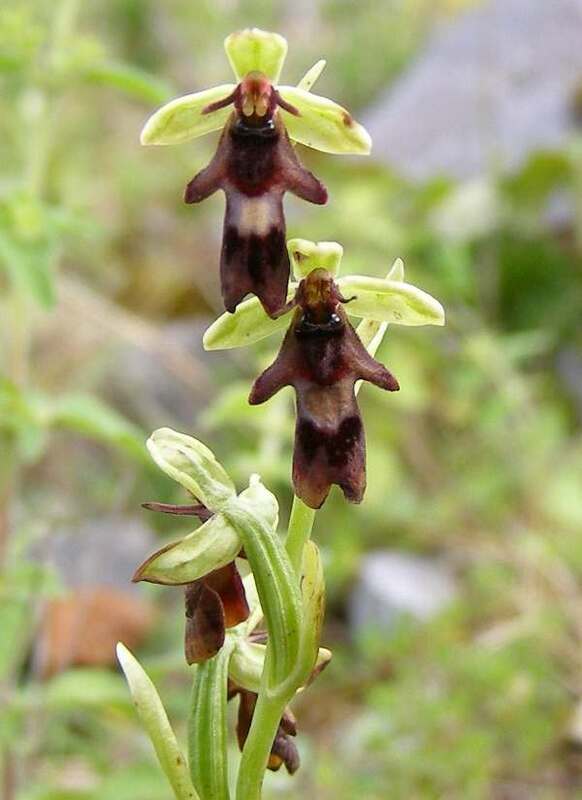 The Fly Orchid is a European plant which can be found as far south as Spain and Greece but, unlike other members of the genus, extends it range into the north as far as Scandinavia, Finland and the Baltic States. It is rare in the UK and Ireland and is restricted to a few places in the southern parts of both countries. It is also found in many European countries. Ophrys insectifera is tolerant of a wide range of habitats and grows in stony grassland, on roadside verges and on the edges of open woodland. It also grows on the limestone pavements turloughs (seasonal lakes) of The Burren in Ireland and Lancashire in northern England. In Wales it grows in the Anglesey Fens where it benefits from the alkaline flushes of water running into the marshy ground. The Fly Orchid flowers in the first half of June. The specimen shown above was photographed in the Burren, County Clare, Ireland in mid-June.